We would like to thank Sir Jason Winters, who has expressed his resolve to aid Healthy & Natural Magazine in interviewing supporters of herbal, dietary and alternative therapies from around the world. He will be speaking to some of the world’s wealthiest and most powerful people, and you might be surprised how many rely on natural remedies and traditional local therapies that are considered “alternative” here in the U.S. Sir Jason tells us that we can look forward to articles from China, Singapore, Manilla, Kuala Lumpur; Argentina, New Zealand, Australia and other countries. This should help our readers to judge how far we’ve come in America in the fight for the “freedom of choice” in health care, compared to the rest of the world. 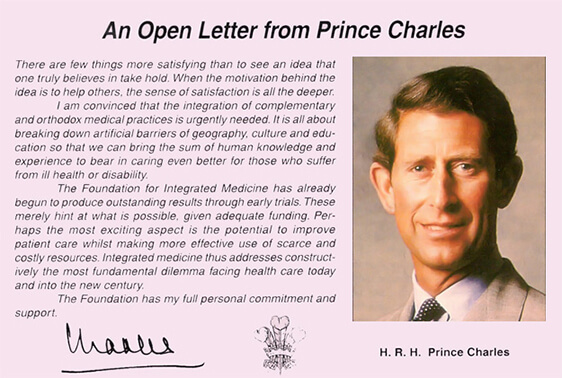 The following statement has been presented exclusively (in the U.S.) to Healthy & Natural by the Offices of His Royal Highness, Prince Charles. This material is reproduced by the kind permission of the president of the Federation for Integrated Medicine, Sir Jason Winters, as well as all the directors of this wonderful organization. Restore to people their feeling of self worth and esteem through active participation in their own treatment, which is often essential for recovery. Over the centuries, vast experience has been gained all over the world from the use of traditional treatments. Some of these treatments will now be researched by the foundation so that the benefits can be enjoyed by people everywhere. This will lead to wider acceptance and greater use. Modern medicine has achieved outstanding results. However, there are increasing limitations and escalating costs. There are now real fears that the demands being placed upon conventional health services may generate burdens which could prove impossible to meet. There is also concern about the potential side effects of treatment. More could be achieved in our health care system, and often at a lower cost, if effective complementary therapies were integrated with existing practice. Existing health care systems are experiencing growing difficulty in addressing 20th Century illnesses, many of which are due to the effects of modern society. This is where the integration of orthodox and complementary medicine can really help. The objectives of the Federation Of Integrated Medicine are to research complementary medical practices and their integration with orthodox medical treatments. Cost benefit analysis and the efficacy of treatments wilt be of prime importance. The research program will be the responsibility of the Research Committee comprised of eminent members of the professions with extensive experience in treatment and research. The outcome of research studies will be subject to independent analysis. The first pilot research study is nearing completion at a major London teaching hospital. The willingness of a unit there to collaborate in this research reflects the interest shown in integrated medicine by one of the most orthodox of establishments, with a world-wide reputation for leading medical research. The first study is examining the use of neuromuscular massage techniques-Marma therapy derived from traditional Indian health care, for the rehabilitation of elderly patients who have had strokes. Early results from this study are promising and planning is underway for a further multi-centre, large scale, study. We have come thus far with the aid of generous private donations. We are now in a position to make real progress in achieving the objectives set out in this document. These are the first, fully-costed research projects planned by the Foundation. This trial will build upon the Foundation’s pilot study of Manna therapy, the ancient Indian neuromuscular massage technique. A multi-centre randomized controlled trial is being planned for 1995/6. This will assess the efficacy of Marma therapy in late stroke rehabilitation, which is rehabilitation of people who have had a stroke at least 6 months previously and who have gained the maximum recovery possible using NHS rehabilitation techniques. There is a need to aid development of the profession of acupuncturists and to spread knowledge of their work. Therefore a national service is to be developed. To establish a database of treatments and outcomes which will influence policy and aid development of the profession. Bronchial Asthma in Children Chronic Brain Injury Management of Irritable Bowel Syndrome Improvement in Function of Autistic and Learning-Disabled Children Chronic Back Pain Acute Cardiac Illness Epilepsy Evaluation of Different Models of Delivering Integrated Medicine Examination of Techniques Used For Diagnosis in Complementary Medicine Identification of Users of Complementary Medicine Who Would Benefit From The Availability of an Integrated Medical Service Evaluation of Different Delivery Methods of integrated Medical Services. A small Board will oversee the policy and management of the Foundation. Hugh van Cutsem, Chairman of the Board Keith Bayliss, Director; Kicinwort Benson Dr. Peter Fenwick, Institute of Psychiatry, The Maudvlcy Hospital Ian Marks CBE, Chairman of the Aim Foundation Professor Richard Petty, University ofPennsylvania The Rt. Hon. the Baroness Rawlings. For further information, please Contact: The Foundation for Integrated Medicine, 7th Floor; Windsor House, 83 Kingsway Landon WC2B 6SD. Telephone: 0171 242 3355. Registered charity number: 1026800. This year-old baby girl caught an infection while on holiday abroad with her parents when she was five months old, which led to congestion of her immune system. Since then she had suffered from recurring ear and bowel infections, tonsillitis, vomiting and general lethargy – although the original infection had been successfully treated. 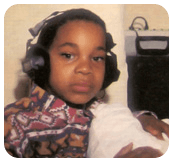 Her mother was told of the benefits of cranial osteopathy, and took her to registered osteopaths who had received postgraduate training with the Osteopathic Centre for Children. Their treatment enabled her to recover fully by helping the drainage within the body to flow naturally, and this was enhancing her immune system. 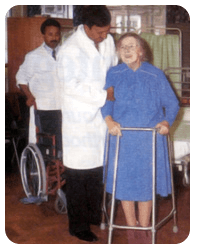 One of the elderly patients at a major London teaching hospital who has benefited from Marma therapy, an ancient form of deep neuromuscular massage which has been used for physical and rehabilitation therapy in India for several centuries. Clinical observation suggests that the massage works by increasing blood flow into the affected groups of muscles, as well as by directly improving muscle tone. It is also believed to improve the flow of information between the muscles and the brain, in this way helping the brain to “re-learn” how to control the muscles after brain damage such as a stroke. The treatment can help with disorders such as learning disabilities, dyslexia, and attention deficit disorder.